For a long time I have felt that the small community that patronises our art, usually constituting diplomats, expatriates and tourists, is not sustainable. They have set for us a standard formula to use in order to satisfy their appetites. I have increasingly grown disillusioned with this state of affairs, and I have decided now to express my opinion. The Abanene exhibition is consistent with the artist Eria “Sane” Nsubuga’s body of work, which aims to reflect the social and political concerns of modern Uganda. For a Kampalan, the word Abanene, or The Big Ones, immediately conveys the figures and portraits that make up this exhibition. Indeed, the term nene comes from the Kiswahili root, meaning fat, thus abanene in Luganda would be in reference to “the fat ones”. The paintings and the archetypes represented in this collection are suddenly familiar: the high, fat cheeks, beady eyes and ‘corruption belly’ of the man in At Serena Hotel, the grin and religious garb of The Happy Confessor, Shanita “Bad Black” Namuyimbwa in The Modern Bride. While the issues he is attempting to shed light on are serious, and concern themselves with the decay and collapse of modern Ugandan morality and society, the pieces can be humorous and cheeky. In Arrogance the character is a literal dickhead, with a semi-erect phallus protruding from his cranium. Abanene, with its uniquely Ugandan characters and local language newspaper cuttings thrown in the mixed media paintings, is not an exhibition tailored for Western eyes. It is intended to spark a conversation in those who are familiar with its context. Some of the pieces, like Prophet at the Door clearly take inspiration from satirical newspaper cartoons, which expect that the reader will have read the articles in order to appreciate the joke. Ugandans will note that the horns that adorn the characters in Corridors (of Power) are not devil horns, but horns of the Ankole cow, and they will understand the complex political-ethnic issues that he has rendered in this visual shorthand. The characters are not to be admired, however much the pop-idol Bebe “Big is Big” Cool, who is featured in a painting, would like you to. At the same time Sane seems to understand the ordinary person’s aspiration to become a Big One. 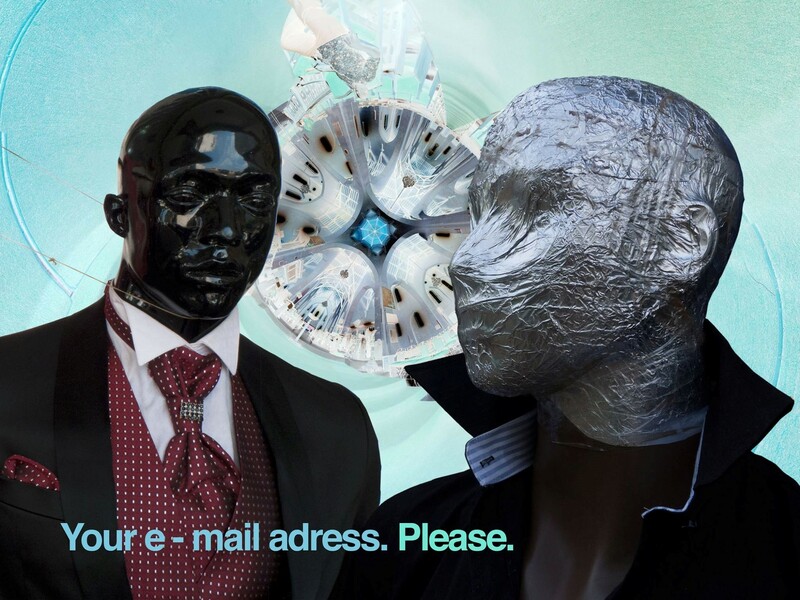 The exhibition features a four minute video done in collaboration with Dragonfly Animations and 32º East. In it, the artist waits six hours to meet an American art dealer in vain. Woven through this is a scene that features men in a taxi park debating the various merits of Bebe Cool and Bobi Wine, “Bobi bought Michael Jackson’s boat”. The lingering question then becomes: When will visual artists command the same stature in Ugandan society as pop artists do? 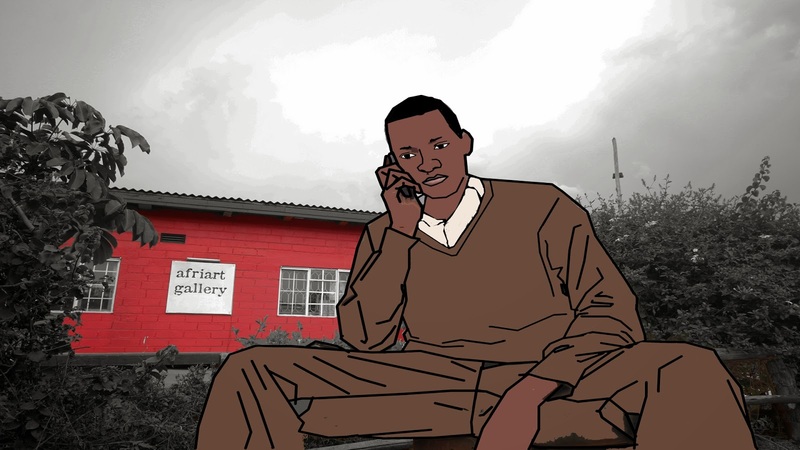 Sane is trying to position himself among a marked disconnect between what the average Ugandan perceives as art, what Western buyers value and pursue in Ugandan art, and what the average Ugandan thinks Western patrons consider art. The community he is criticising is at the same time the one that buys his art, with Europeans and Americans making up around half of those in attendance at the opening of the exhibition. These are the contradictions that Sane attempts to embody honestly within his work. While we cannot always be honest in our social interactions, waiting on the whims of foreign art collectors and pandering to those that hold the money and power in society, Sane can be truthful in his work. Talking to people is, after all, fraught with traps; meaning, intention, status, innuendo, and power. The canvas can be clearer. 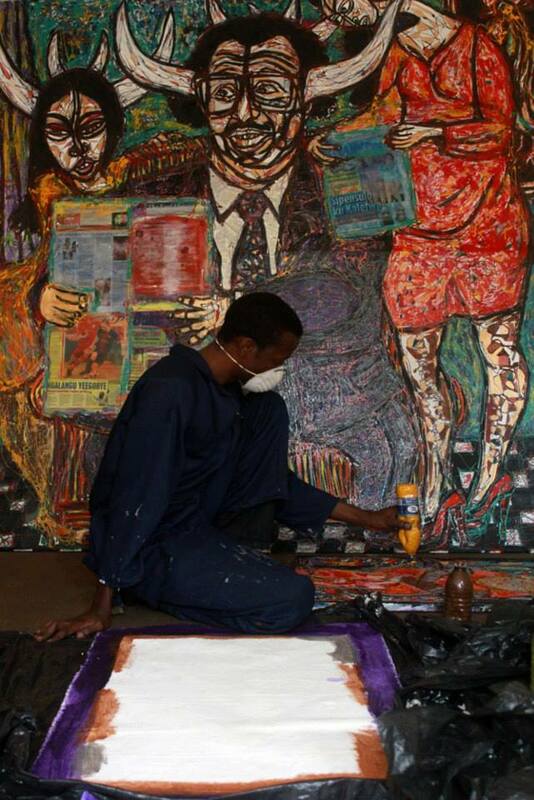 Abanene features vibrant, chaotic colours, which up close are cacophonous and discordant. Step back, however and those brown squiggly lines become the caramel curve of a woman’s calf muscle. Just like Kampala, which is rotting fruit peels and brown puddles in potholes up close, from the top of a hill, or the window seat of an airplane, it is twinkling lights and breathtaking lake views. While previous exhibitions have veered towards the heavy-handed, for the most part in this exhibition Sane is able to step back and allow the viewer to interpret the work with minimal interference from him. Text in the paintings guide the viewer but do not attempt to make their mind up for them. The paintings may be too didactic, perhaps too provocative to hang in your living room, but they are aesthetically pleasing, and evidence of the technical skill and increasing maturity of the artist. Kampire Bahana is an avid reader, a writer and sometimes poet who is formally employed in the NGO world.